Transportation plays a very important role in the economical development of any country. Pakistan is the 6th most populated country in the world exceeding 195 Million people. Thousands of people travel on daily basis including students, tourists and business class. The most popular mode of transportation in Pakistan is by Road. So Buses and coaches are playing a vital role in road transportation. Here from horrible shaped Government Lorries to Private luxury coaches are ready to serve 24/7. People who travel by Government buses have a lot of complaints as there are no Air conditioners, huge load, rude behavior of conductor, lack of bus staff, congestion of buses, postponing of buses and a lot of other irritating issues which are suffered by people. However they are much satisfied with the service of Private companies like Daewoo Express. Why People prefer Daewoo Express ? 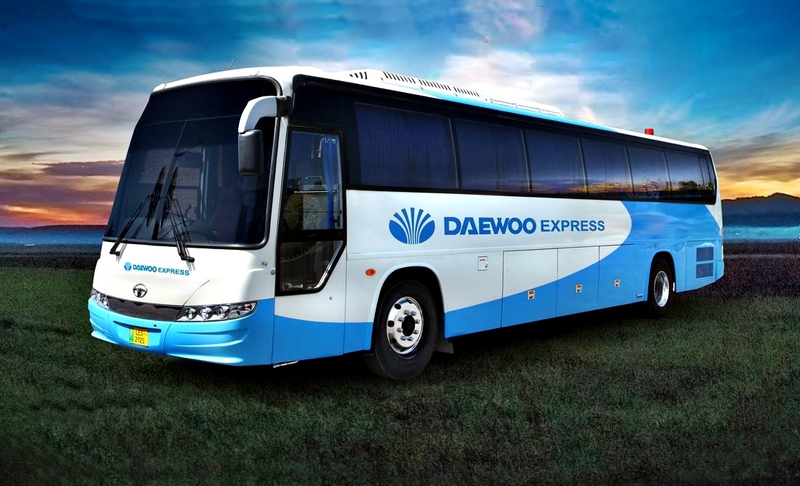 Daewoo Express, a Korean company, which was established 30 years ago is functioning in Pakistan since 1993. It has literally changed the concept of travelling in Pakistan. Maloomaat.com conducted a survey and came to this point that people who prefer to travel through private buses consider Daewoo Bus Service the best transport service in Pakistan. According to them there are several reasons (explained below) which make Daewoo Bus Service, the no 1. Daewoo guarantees its travelers a safe and secure adventure. For this purpose a Security Department is working with profoundly proficient staff. All staff individuals are Ex-Army authorities. Every security guard is hired after extensive screening process which puts the best possible candidate for the job. Abundant customer and quality services are given by Daewoo Express to its passengers. Daewoo Express serves excellent refreshment including fresh sandwich, snacks and biscuits. Water and Drink is served again and again right after 15-20 minutes. Bus hostess provides earphones to those passengers who would prefer not to watch films on television screen. Bus host/hostess do proper announcement about upcoming stop. Gone are those days when you had to visit bus stations to book a ticket. Daewoo express gives its customers one of best facility to book ticket from home. You can book seats as much as you want on just a phone call. Just call Daewoo helpline tell them the exact departure date and time and how much seats you need to book. Relax and sit back. After a while a confirming message will come to your phone assuring about your booked seats. Covering from Islamabad to Karachi Daewoo Express has the largest Bus service Network in Pakistan. Every stop has its own Car parking, while main stops have gift shops and Cafeterias which offers tasty Pakistani and Fast food. Daewoo express bus service has finest and trained drivers. They hire drivers and technicians through a comprehensive testing and observation process. During the test, experts observe the candidates keenly both practically and theoretically. Daewoo buses have very comfortable seats and fine Air conditioning system. It is the one who introduced bus hostess system and presented transport master framework. The uncommon training is likewise given to bus hostess and security monitors. Reliability and consistency is the key component of Daewoo administration. Buses are always on time and you get to your destination before the told time. Daewoo bus service gives significance value to their customers, so as their time. Daewoo Express entertains its customers through quality movies and fine music. Newspaper and Magazine named “Hamari Manzilen” are provided to individual passenger which adds joyful moments during the journey. There is likewise a department for lost and discovered baggage in Daewoo Express. This is the enormous capability gave by Daewoo Express to its travelers. The main perspective of any individual is to insure the risk free journey while travel in any vehicle. Daewoo Express gives protection and life insurance facility to every single traveler. After this whole discussion, we can say that Daewoo has really served passengers in a very impressive way. There is always a space for improvement. We do hope that Daewoo Bus Service will maintain its standard and will keep satisfying its passengers.